Posted April 23rd, 2015 at 2:35 pm. 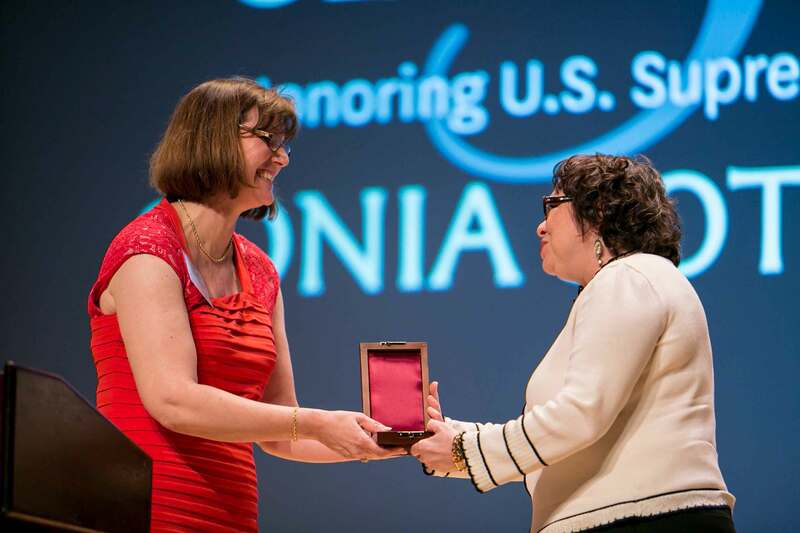 The 2015 Katharine Hepburn Medal was awarded to U.S. Supreme Court Justice Sonia Sotomayor on Friday, April 17 at a ceremony in Goodhart Hall. 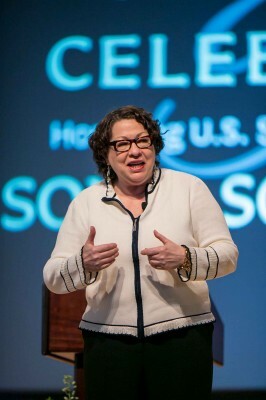 In accepting the award, Justice Sotomayor noted the influence Bryn Mawr had on the life of the women for whom it is named and the enduring power of sisterhood. Justice Sotomayor went on to talk about the many women who have served as friends and mentors to her throughout her life and to encourage the audience to take up mentorship roles themselves. 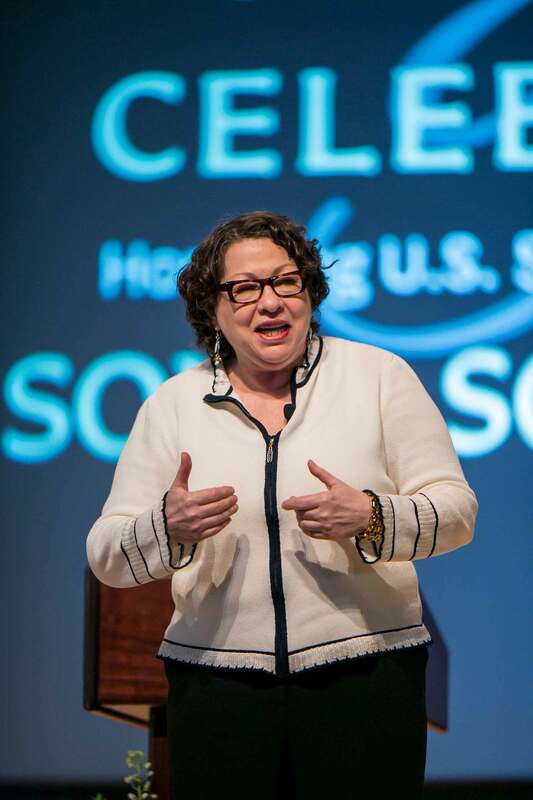 “As much as I have learned from those who have served as my mentors, I have learned just as much from the relationships in which I have been the mentor,” said Justice Sotomayor. In closing, Justice Sotomayor gave thanks for being honored with the 2015 Hepburn Medal. “It is humbling to be the recipient of an honor named after these extraordinary women. I will cherish it and the time I have spent on campus with all of you,” she said to a great round of applause. Bryn Mawr Trustee Margaret Morrow ’71, U.S. District Judge for the Central District of Southern California, gave introductory remarks at the ceremony as did Bryn Mawr President Kim Cassidy, who presented the medal to Sotomayor. As a special surprise, Kenneth Moy, a close friend of Sotomayor’s since high school, also spoke. Noting that the Hepburn Medal is named for both the four-time Oscar winner and her mother, who was an activist in the suffrage and birth-control movements, Moy took the opportunity to honor Sotomayor’s mother. Moy told the story of when he and Sotomayor were teenagers and, along with some other friends, they had made enough noise having a party in the Sotomayor family’s apartment to bring a building security officer who threated to throw the teens out if they didn’t quite down. Earlier in the day, Bryn Mawr students filled Goodhart Hall for a chance to meet with Justice Sotomayor. The Katharine Hepburn Medal recognizes women who change their worlds: those whose lives, work, and contributions embody the intelligence, drive, and independence of the four-time Oscar winner and her namesake mother, an early feminist activist. Award recipients are chosen on the basis of their commitment and contributions to the Hepburn women’s greatest passions—civic engagement and the arts. The Katharine Houghton Hepburn Center memorializes Hepburn and her mother with programs focusing on the arts and theater and civic engagement. The Hepburn Center is the only organization authorized by the Hepburn estate to commemorate the lives and achievements of iconic screen legend Katharine Hepburn, Bryn Mawr class of 1928, and her mother Katharine Houghton Hepburn, Bryn Mawr class of 1900, who was an activist for reproductive rights and women’s suffrage. Former Hepburn Medal recipients include the actresses Lauren Bacall and Blythe Danner; Jane Golden, executive director of Philadelphia’s Mural Arts Program; Helene Gayle, president and chief executive officer of the international humanitarian organization CARE; and musician Patti Smith. For more information on the Hepburn Center, as well as biographies of Katharine Hepburn and her mother, Katharine Houghton Hepburn, visit the Katharine Houghton Hepburn Center website. For additional images from Justice Sotomayor’s visit, see this online gallery.